This list is designed as some pointers to get you started and is in no way exhaustive. 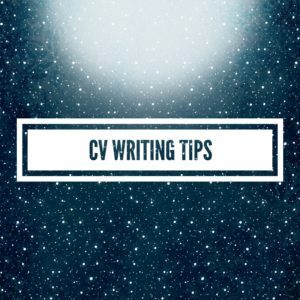 Before you start – it is worth considering if it more useful to have a number of CVs for different job roles. Each one must be consistent in style but make easy reading for an employer in whichever industry you are working. E.g. have one as a TV Runner and another as a web designer (although in that specific instance it would be useful to list your html skills in your TV CV). * Call your CV filename ‘ YOUR NAME – YOUR JOB TITLE – YEAR‘ so that employers can easily find you if they save it in a folder. * Put your job title at the top near your name. Employers want to know what you do very quickly and will spot it straight away. * Next do some bullet points of your key skills e.g. One line is sufficient to describe the programme and include the broadcaster. 2 lines description max. * If you are relatively junior, you could briefly mention tasks that were delegated to you by a more senior person. * Keep all your TV work together and list anything else you think could be useful in an ‘other employment’ section after your TV work if you feel this is supportive. * Briefly list your education. Bullet points are best. * Any relevant training should go last right at the bottom and you should list exactly which course you completed and the date. So find out the name and governing body of the course. First Aid, Health & Safety, Hostile Environment courses are as important as technical equipment training. * You can list your references if you want to. Be sure to ask the person whose details you will be including BEFORE you do this. Also, if you provide them as a reference in an interview, be sure to tell them before the potential employer actually calls them! * Your CV should be around 2 pages long. One page if you are a Runner and no more! *Check your spelling and grammar. Do not write “drivers license”, it is incorrect. Use these words: “driving licence”. *Do not combine your student film making experience with your professional work. *Name your CV . Give it your name and your job title. Do not say you are a Producer or Director or Editor if you are a Runner. If you are a runner, the PM wants to see your running experience, they are not interested in your producing or directing experience. *Always write something in the email when you send your CV in application for a job. If you can’t be bothered writing to say what job you are applying for and why, they may well not bother opening the attachment! *Be straight. Be honest. Do not big yourself up; it will not get you the job and you will be found out!